The story of Chez Claude now translated to English. Click the CC / subtitles to turn on the subtitles. Our story is, I think, a great classic! Everything began two years ago, with a lack of any curves in our city we decided to take our fate into our own hands and build our own spot! For that it was necessary for us to find a good place! A few kilometers later, in an old caterpillar factory in the outskirts of the city we found what would make for a good, chill spot. We had the place where we would being the “Chez Claude” adventure. Nico Barbe. 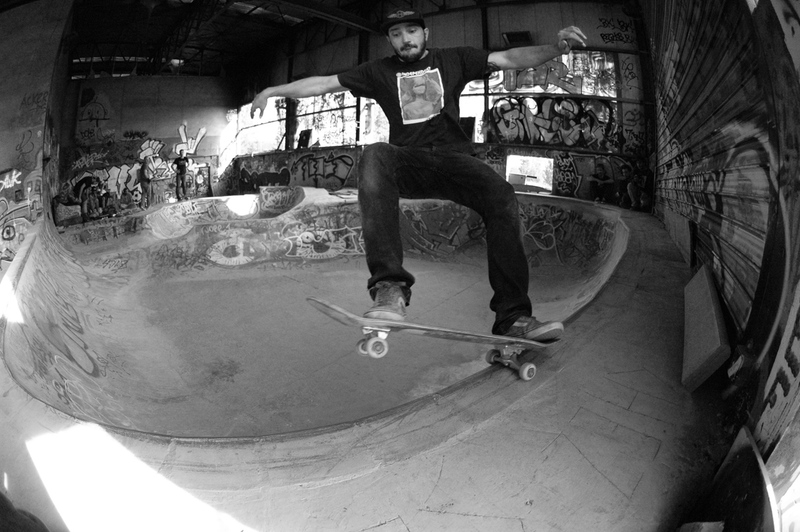 BS smith grind. The work began with difficulty because we had no knowledge in concrete but we managed to make the first modules with some cement and dirt! 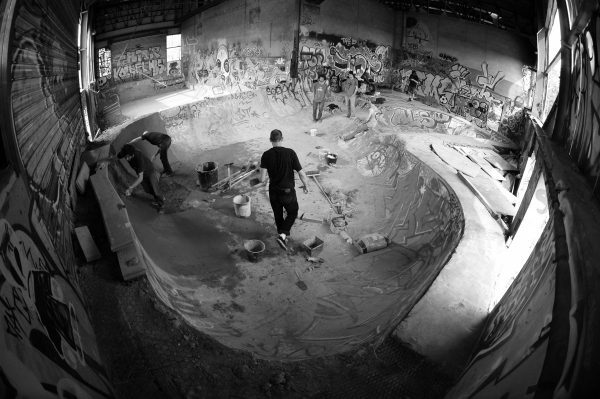 Then the meeting with the famous Claude – skater and master in concrete who has lived in Toulouse for a short time. We were saved and we named the spot in his honor! The continuation?!! Everything went faster. We bought many bags of cement and sand and we worked on the construction of two other modules and then on the first bowl (the bath). If you come one day to “Chez Claude” you can look how we did it, with old doors, old office parts, rubble – everything for the structure we found at the spot. Finally, we cut the wire from the factory to put in the concrete – all is recycled, hahahaha. Look around you, all you need is there! Guillaume Challet. FS five-o grind. After approximately one year of hard skating and great moments of pleasure and fun, we decided to upgrade the spot with a second bowl section connecting to the first one. That was hard to return to work, but now we knew how to make it. The second section of the bowl was made in two months with the help of many friends and the result was sick, with pool coping and a very RAD radius! CHEZ CLAUDE ACTIVISTS: Claude Chéradame, PIF, Alex fernandez, Nico Barbe, Guillaume Basset, Guillaume Challet, Yann Mé, David Adhoffer, Nico raynaud, Laguigui, Axel Arro. Special thanks to ASTUSS, and all occasional workers!! RESPECT!! CHEZ CLAUDE! DELECT!